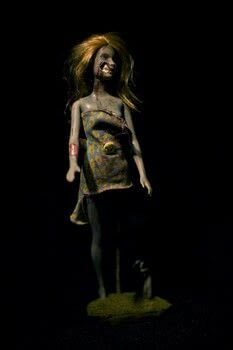 Turn a pretty Barbie doll into a brain-eating zombie. 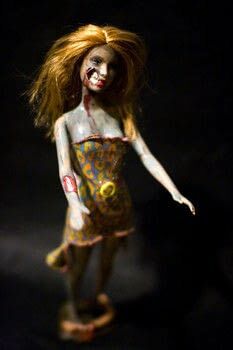 Did you ever want to turn your pretty Barbie doll into a brain-eating zombie? No? Well, now you're going to learn how anyway. 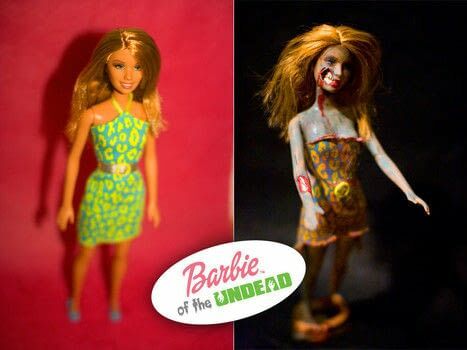 The cool guys at CO+K asked me to write a little guide on how i went about making my Barbie of The Undead. I’m not going to claim I’m the first to do this, you’ll find lots of them on Google. But for some reason people seemed to like my zombie, when they really should be scared to death. Really. The doll First you'll need to get hold of a suitable doll. The cool thing to do is stealing it from a sister or cousin or something, but if you want to be dull, you can buy one. You’ll find them in all toy stores, and also find tons of them on ebay, flea markets etc. The plan When you’ve got your doll you should make a plan. 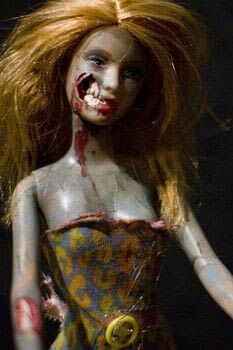 I’ve seen quite a few zombie Barbies now, and most of them just end up a ugly mess. 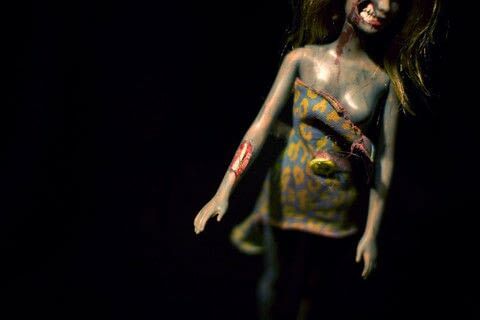 It’s important to keep her looking like a pretty girl – a pretty dead girl. 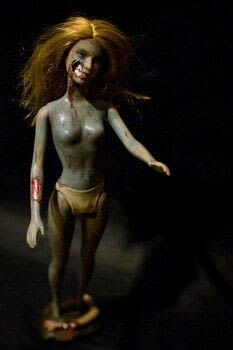 You do not want to cut her in pieces and smear blood all over her. Take a look at some zombie flicks for inspiration. I’ll just assume your Barbie-destruction-plan is similar to mine, and explain what I did. The face So I was going to tear part of her face off. 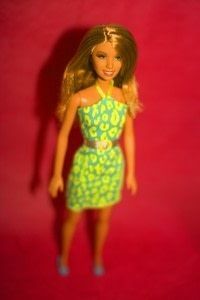 The only problem is that barbies are pretty darned empty-headed. I needed to fill her up to get the desired effect. I used a paper knife to make a small surgical incision in the back of her head. This made a slot for me to fit a scull. 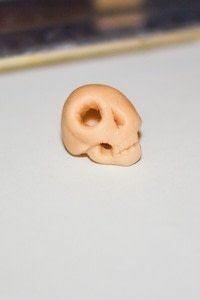 I often use this clay called Super Sculpey. It’s great for making all sorts of stuff. It’s easy to shape, light of colour, and bakes in a regular oven in just 15 minutes. Now for the skull. I wasn’t sure how much of her face I was going to cut off, so I made more details to the skull than was actually visible on the finished doll. 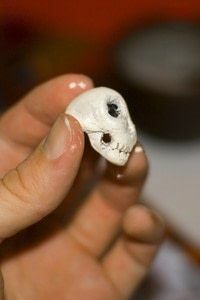 The scull was painted with a few strokes of regular acrylic paint. Luckily the scull was a perfect fit – it wouldn’t be easy getting it out again. The arm I then started cutting up her arm. You can’t see it clearly on the photo, but as the arm is not hallow, i could just carve out a bone. 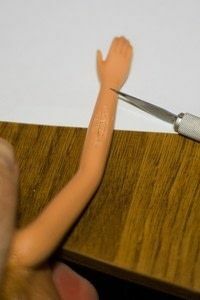 You’ll see it better on the finished doll. The paint Painting a zombie is fairly simple. You’ll need to mix a few colours to get your rotten flesh tone. I used acrylics paint, and also mixed it with some water to get it very thin. I wanted the original skin colour to still be visible. Her hair was also randomly cut, and I actually took some dirt from my back yard for the finishing touch. Lastly you’ll want some blood. Again – the important thing is not to overdo it. And try to think how blood would be running on a real person. But don’t do too much research. The base When finishing up, I realized Barbies are not very good at standing. I guess they’ve been walking on heels too much. 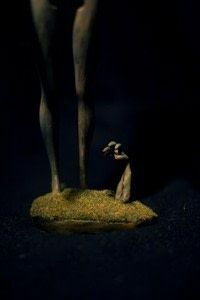 I made my doll a base (again of Super Sculpey) to fit her feet. This was done in a hurry, and I wasn’t pleased with it at all, so recently I made her a new one. This is actually the first time I show anybody this updated version, so I hope you like it! 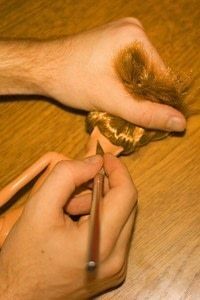 The end Now you should be ready to beautify some way too pretty dolls. Good luck!